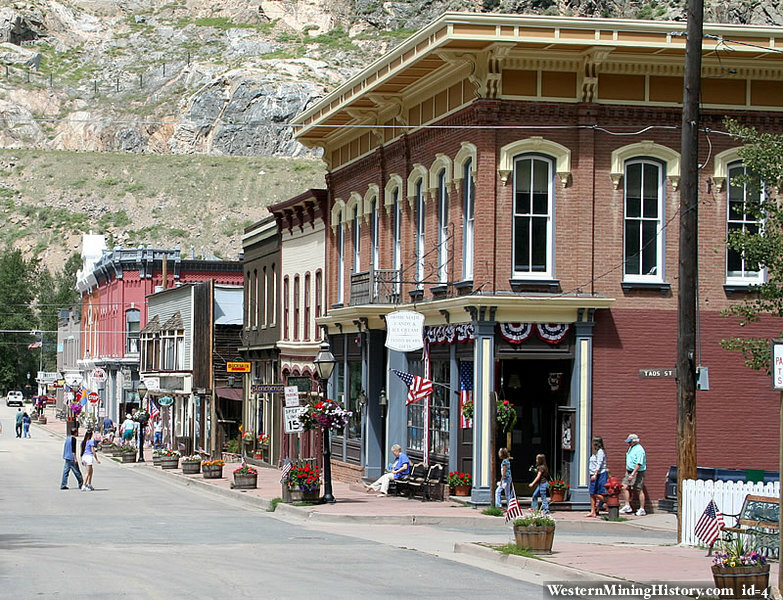 Georgetown, Colorado was settled after the discovery of gold in 1859. The settlement would ultimately become the center of a major silver district and Colorado’s most important mining town of the 1870’s. David and George Griffith discovered gold near the head of Clear Creek during the summer of 1859. The location of this discovery would become the mining camp of Georgetown, named after George Griffith. The brothers discovered several promising outcrops of ore and George Griffith travelled to Central City to file their claims. The pair were soon joined by their brother John, who assisted with development work on the claims and the construction of a cabin. The Griffiths sank several shafts and which returned hundreds of dollars in gold. The named the site if their discoveries the “Griffith mining district”. The brothers also discovered silver ore but at the time most miners in the area were after gold so the Griffiths ignored the silver for the time. These were likely the first significant silver discoveries in the state of Colorado, and would ultimately turn Georgetown into one of the state’s richest mining areas. Most miners left the mountain camps during the winter of 1859-60 and the Georgetown mines were idle. The Griffiths returned to the mountains in the spring of 1860, bringing with them their families and supplies to sustain them at the camp and facilitate development of their claims. They quickly discovered that without a road they would not be able to get the supplies to their mines. 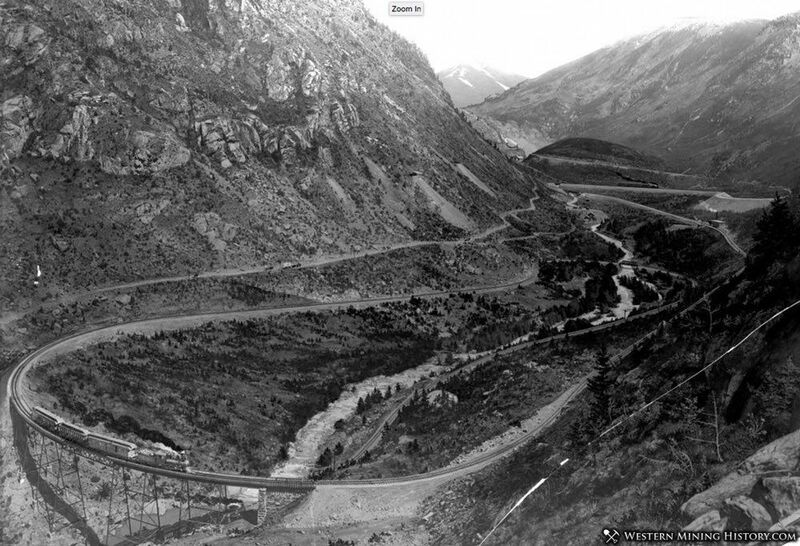 Highlighting the difficulty of opening new districts in the mountains of Colorado, the Griffiths were forced to create a road building company and construct their own toll road from Central City to the Georgetown site. The road was completed by summer of 1860, and shortly after the settlement of Georgetown was officially dedicated on June 29, 1860. The future looked bright for both Georgetown and the Griffiths, but misfortune was just around the corner. The period between late 1861 and spring of 1864 was marked by difficulties processing local ores with current technology, and economic turbulence resulting from waning confidence in Colorado mines by eastern investors. An 1862 boom in the adjacent Union mining district drew men, capital, and attention away from Georgetown. The Griffith family splintered during this time and by 1864 only George Griffith remained in Georgetown. 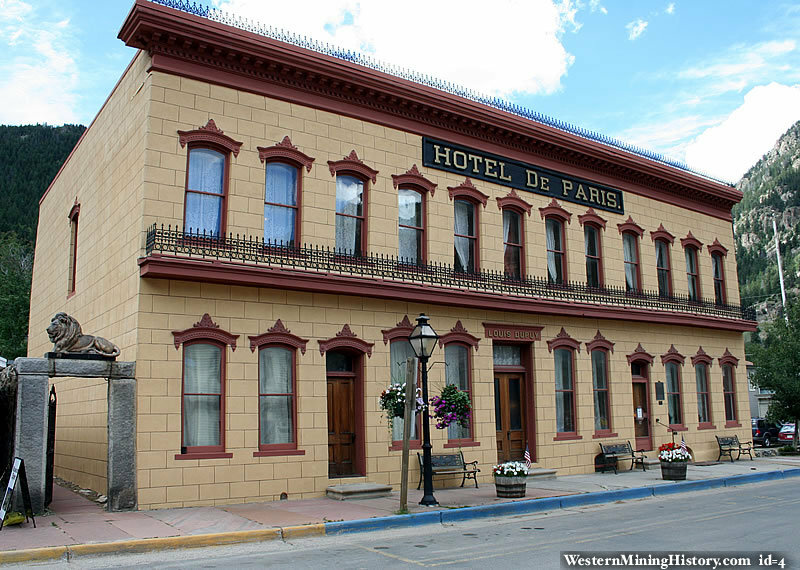 He left that year and moved to Mexico, never to see his namesake town become one of the richest mining cities in the West. By the fall of 1864 most of the placer mines had been worked out and the gold lode mines were starting to decline throughout the territory. Rich new silver discoveries were made near the head of Clear Creek and attention returned to Georgetown and the potential of silver mines in the area. The first silver rush in Colorado occurred in 1865 as the winter snows melted and word spread of the rich discoveries near Georgetown. The new silver mines were at high elevation, and were not at suitable locations for settlements. Georgetown became the supply and social center of what was becoming a vast empire of silver as new discoveries continued to be made. In 1865 a new town was laid out adjacent to the Georgetown site and was named Elizabethtown. By 1866, it became clear that the two towns would better operate as one, and they were merged under the Georgetown name. The silver boom intensified in 1866 as the end of the Civil War allowed Eastern capitalists to focus on new ventures in the West. Georgetown was a legitimate boom town by 1867, and was incorporated in 1868. Later that year, the town took the county seat of Clear Creek county from nearby Idaho Springs. The buildings mostly new, and neatly constructed, seem to have spring up spontaneously from the earth like the trees, grass, and flowers. None of that dingy, decayed tumble down appearance that so often marks the older mining towns, is seen anywhere about the place. Georgetown became the town that influential Easterners wanted to build into a permanent city. Sons of prominent eastern businessmen arrived with capital build the new city. 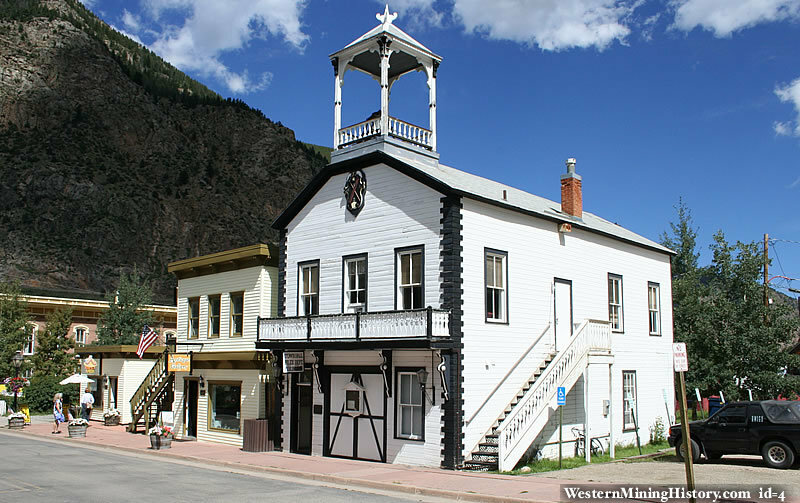 Eastern churches of many denominations sent missionaries to establish churches in what was destined to become the cultural center of the Colorado mining districts. Georgetown... Is quite the nicest bit of inhabited portion of the mountains. Around and above this now thriving and most beautifully located of the principal mining villages of Colorado are many marvelously rich silver veins. It is one of the places that every tourist should visit. 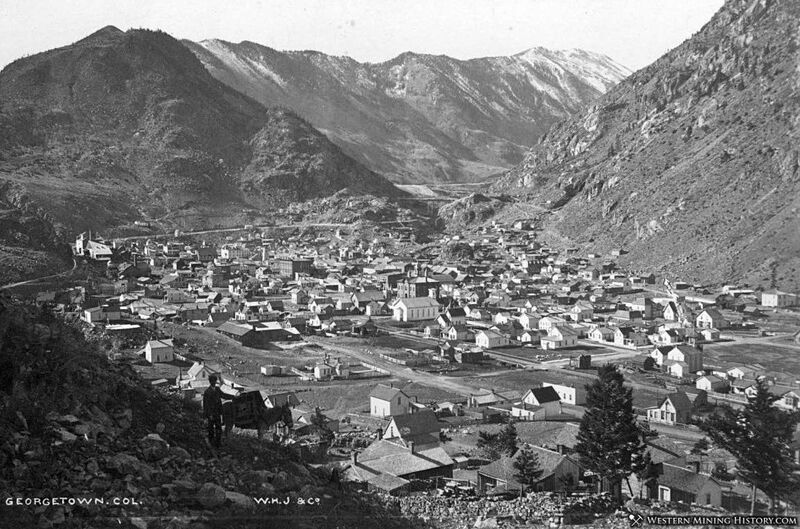 During the silver craze of the late 1860’s, residents and promoters of Georgetown and its mines were expecting the district to be the next Comstock Lode. These hopes were dashed however as the reality of developing high altitude mines with complex ores set in. The challenges related to developing mines in an extremely mountainous district with no railroad link were daunting. New smelting processes needed to be developed to reduce the varied and complex ores. The needed improvements in transportation and reduction technology would take years to develop. The first smelter built treat the ores was completed in Central City in 1868. The operation was not initially successful, and was the beginning of numerous attempts at developing reduction techniques to treat the region’s ores. These experiments would go on for years, and while progress was made, it would take almost a decade to solve many of the problems related to ore reduction. 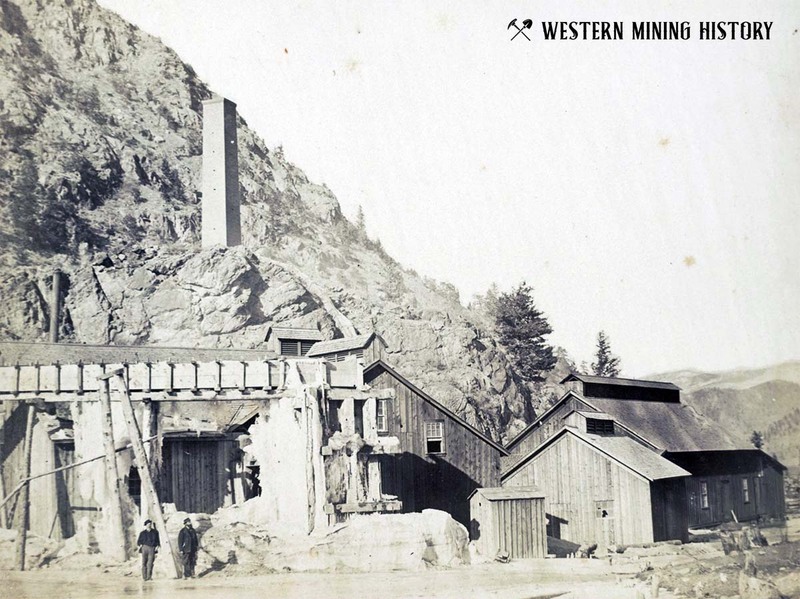 The difficulties of mining in the Clear Creek district resulted in several important technological advances in the mining industry: the mechanical rock drill, the aerial tram, and new ore reduction techniques that would benefit mining districts throughout Colorado. The 1870’s would see many of these problems solved, and Georgetown would rise to prominence among Colorado’s mining districts. Despite the difficulties the miner’s faced, the district, and Georgetown continued to grow. By 1870 the town had around 800 residents, and was the largest in the county. Log structures were being replaced by permanent brick buildings. 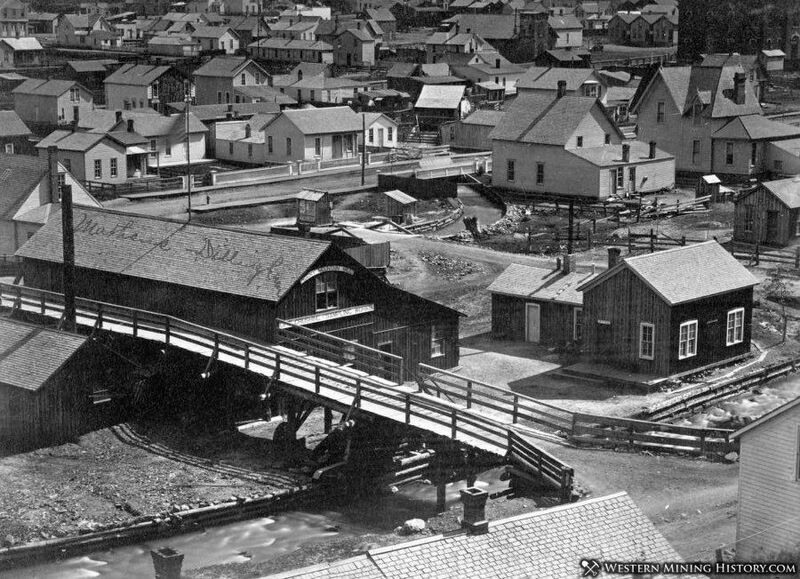 Georgetown was developing an international reputation both as a prominent mining center, but also as one of America’s premier tourist destinations. 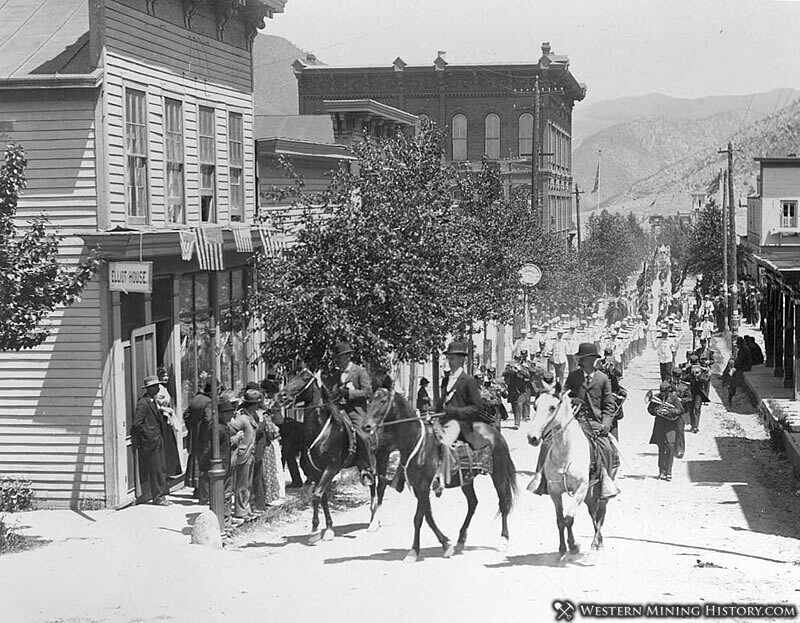 Adventurous travelers wanting to see the western frontier were turning Georgetown into one of the West’s earliest vacation towns. Prominent Europeans were visiting and writing about the wonders of Georgetown back home, creating much interest in the area with tourists from countries like England and France. Upon the completion of the railroad into Georgetown - probably about the 14th of August - this city will put on its holiday attire and indulge in a celebration of the gala day of its history…… everybody in the Silver Queen will put on his best bib and tucker, and turn out to make this the biggest day ever seen in Georgetown. It was reported that 8,000 people attended the celebration. 1874 Clear Creek county surpassed neighboring Gilpin county as Colorado’s largest producer of precious metals. By 1878, Georgetown had peaked as a silver district with around 2,000 men employed at mines, mills, and related industries. The city of Georgetown was estimated to have around 10,000 residents, securing its position as “The Silver Queen of Colorado”. Georgetown’s position as Colorado’s premier mining camp was short lived. Spectacular silver discoveries at Leadville eclipsed anything that had occurred before in the state, and would be one of the West’s most dramatic and important events. The great boom at Leadville drew attention, capital, and experienced mining men away from Georgetown. 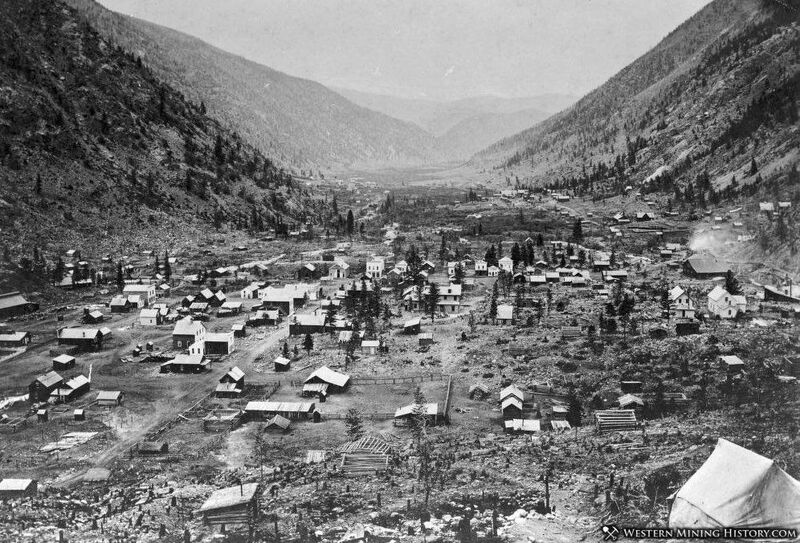 Subsequent discoveries at Aspen and the San Juan Mountains would further dilute Georgetown’s reputation among Colorado mining towns. Georgetown’s mining industry continued to produce more than one million dollars in precious metals each year throughout the 1880’s, with some years surpassing the two million dollar mark. While this level of production was certainly respectable, it didn’t match the vast riches being taken out of the ground in Leadville, and Georgetown would never again regain the spotlight. While Georgetown of the late 1880’s continued to be an important mining town, it had declined significantly from its peak a decade earlier. The Sherman Silver Purchase Act of 1890 once again stimulated Clear Creek mines and Georgetown experienced a final boom between 1890 and 1892. During this time, many new commercial and residential buildings were constructed and public works like electric street lights and a sewer system brought the aging town into the modern era. In 1893, the combination of a national depression, and the repeal of the Sherman Act, resulted in the worst economic crisis in Colorado’s history. Silver prices crashed and mining districts that were primarily silver producers were hit the hardest. The price of silver continued to decline through the 1890s, crippling Georgetown’s mining industry. The Silver Queen would never again be a boom town. World War I brought the district back to life for a couple years as demand for lead soared. Newspapers reported that in 1917 the population of Georgetown had more than doubled from 600 to 1,400 residents. This revival was to be short lived however as lead prices returned to normal after the war. Georgetown continued to decline through the 1900s, reaching a low point in 1960 with a population of just 307 residents. Ultimately it would be tourism, first promoted almost a century earlier, that would revitalize and reshape the town for the modern era. Georgetown had become a popular stop for tourists heading to ski resorts in the mountains as early as the 1950s. 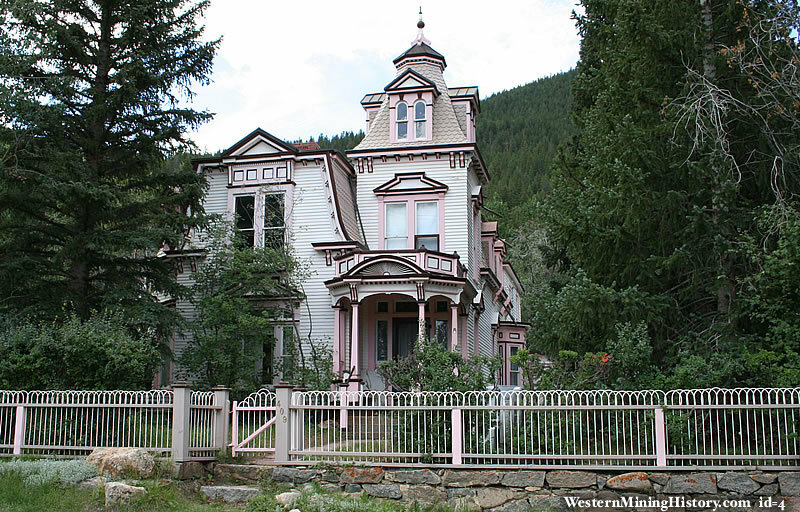 In 1966, the Georgetown-Silver Plume National Historic District was designated as a National Historic Landmark. Today, Georgetown’s population has rebounded to over 1,000 residents. Extensive preservation and rehabilitation has resulted in Georgetown being one of the best preserved examples of Victorian era mining boom towns in the West. Over 200 19th century structures are still standing. The Georgetown Loop Railroad, originally built in 1884, is a 4.5 mile narrow gauge railroad that runs between Georgetown and Silver Plume. The route traverses a narrow canyon with many horseshoe bends and four bridges over Clear Creek. This rail loop was popular with tourists since it was first built. Auto touring became popular in the early 1900’s and between the decline in rail tourism and the closure of mines during World War II, the railroad stopped operating in 1938. After the closure the line was dismantled and that was seemingly the end of the Georgetown Loop Railroad. In 1959, on the 100 year anniversary of the discovery of gold at Georgetown, an plans were made to bring the railroad back. Land was acquired through the 1960s and the loop was reconstructed between 1969 and the 1980s, with the Devil’s Gate High Bridge being reconstructed in 1984 to mark the 100 anniversary of the line. Tourists can once again take scenic rides on this this historic railroad. Check the Georgetown Loop Railroad website for more information.